Today was the day. 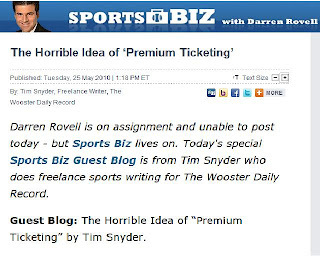 I had known for a few weeks that my submission to the CNBC Sports Biz "Guest Blogger" contest had been selected, but had yet to see it get published...and I was TERRIFIED. 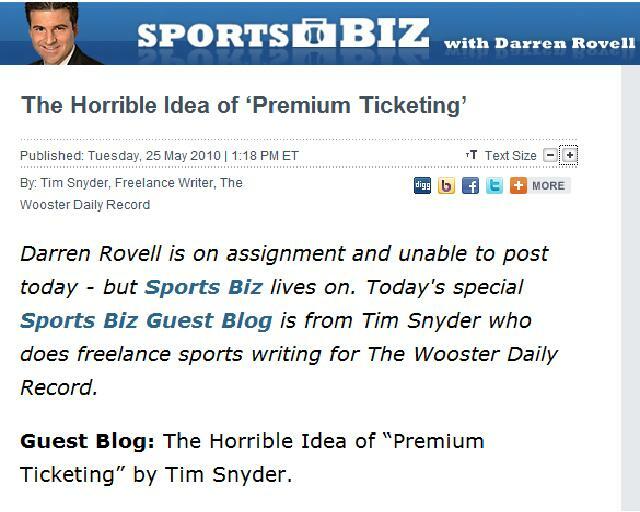 I knew the guest blogs were to run through the 25th of May and that mine was one of two yet to be published. Chase Hoobler & Sam Miller's time as Orrville Red Riders are in their final days. A senior season that saw the duo play leading roles in the Div. 4 regional runner-up football team and the Div. 3 state runner-up basketball team will be memories they carry with them for a long time. And yes, the addage of "once a Rider, always a Rider," is true, but not really. This fall, Chase will be an Indiana Hoosier and Sam will be a Golden Flash at Kent St., and after that, who knows...the only certain thing will be change from here on out. About all that's left in their senior year is the scholarship assembly, the graduation ceremony and a gathering of family and friends to celebrate the end of one era, and the beginning of another. Once all the graduation dust settles, Chase & Sam will suit up one last time as a representative of Orrville High School, and this time, as representatives of the state of Ohio also. The All-Ohio duo along with Orrville head coach Doug Davault have been selected to participate in the Big33 Ohio vs. Pennsylvania All-Star football game. The event will be held in Hershey, PA on June 19th, with kickoff at Hershey Park Stadium slated for 7:00pm. Let's look at the 1990 season and playoffs. The Riders were coming off a 4-loss season in 1989 and a 28-0 playoff drubbing at the hands of Ironton (the eventual state champ). A talented junior class would now lead the team as seniors, and as always, expectations were high.